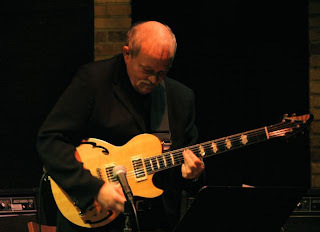 11/5/07, The Dakota: When I visited John Abercrombie's Web site, I thought at first that unlike most artists' sites, his was up to date; I had to scroll and scroll to reach the end of his considerable discography. Then I saw that it ended with The Hudson Project, which came out in 2000. There have been several CDs since, up to and including The Third Quartet, the 2007 ECM release that's the reason for his current tour. This is not actually Abercrombie's third quartet, but (he explained) the third recording by this particular quartet, except the one we saw had Scott Colley on bass, not Marc Johnson, who's the bass player on the CDs. The two previous quartet recordings are Class Trip (2004) and Cat 'n' Mouse (2002). The music was chamber and folk, free and structured, serious jazz and twisted country, solo, ensemble, call-and-response. It was sad and hilarious. It stretched and snapped. It soared into the stratosphere. Sometimes ("Banshee") it started out slow and whispery and built to a wail. It was about cats, jackalopes, and Abercrombie's parents. At one point, Baron drummed faster and faster and everyone else kept up until there were eight blurry hands. The encore, Bill Evans's "Epilogue," was incredibly tender, a sweet parting gift. I left wanting more. So glad there's iTunes, the 24-hour music store. I'm listening now to Feldman's No Exit, his first release on ECM. It's also a quartet recording, with three other artists I don't know: bassist Anders Jormin, pianist John Taylor, and drummer Tom Rainey. Now I'm thinking how great it would be if Feldman and Hank Roberts played together someday. Photos: John Abercrombie; L to R: Feldman, Colley, Baron, Abercrombie. Photos by John Whiting.